After breaking the heart of third-round opponent Albert Montanes, Roger Federer broke the hearts of millions of Australians when he said his family had nearly migrated to the country when he was in his early teens. In a courtside interview after demolishing the Spaniard 6-3, 6-4, 6-4 at Rod Laver Arena on Saturday, Federer said his parents had discussed moving Down Under when his father worked a three-month stint there, but ultimately decided against it. The idea of a missed chance to adopt the eventual 15-time grand slam champion prompted groans from thousands of local fans at centre court. "I was maybe 12, 14 years old. I remember actually my parents having a debate, are we moving away from Switzerland to come live over here," Federer told reporters. "At the end, they just said, 'look, we have all our friends over here'. And even though it's lucrative and nice to go to Australia, they love the country, they also asked us kids. "And we were like, whatever the parents decide. What are we gonna decide here?" While unlikely to consider switching citizenship, Federer's temporary residence in Australia has been prolonged for another few days with his impressive display against 31st seed Montanes. The Swiss maestro clubbed 36 winners and 10 aces in the 108-minute victory, which preserved his record of reaching the last 16 of every grand slam since losing in the third round of the 2004 French Open. 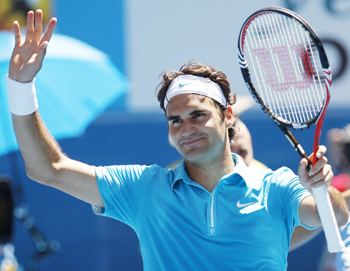 Image: Roger Federer waves to the crowd after winning against Albert Montanes. Marcos Baghdatis retired from his match against Lleyton Hewitt on Saturday due to injury to gift the Australian a free pass to the fourth round at Melbourne Park. Baghdatis and Hewitt played an epic five-set match that finished after 0430 in 2008, the latest-finishing match in the tournament's history, but hopes of a similar hard-fought contest were snuffed out when the Cypriot walked off when trailing 4-2 in the second set after losing the first 6-0. Baghdatis, who was attended to by trainers during the break after the first set, had experienced cramping in his five-set second-round win over David Ferrer. "He just said he was obviously feeling it in his serve a little bit... his shoulder," Hewitt said in a courtside interview after the match. "He just wished me good luck." 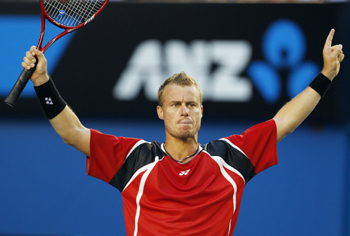 Hewitt will now meet Roger Federer in the fourth round. Image: Lleyton Hewitt waves to the crowd after his opponent Marcos Baghdatis retired from the match. Russia's Svetlana Kuznetsova has joined the growing chorus of players questioning the wisdom of scheduling late night matches at the Australian Open. The top men have been complaining about the programming for years after being forced to play into the early hours of the next day and now the women have added their voice. The issue reached farcical proportions two years ago when a match between Lleyton Hewitt and Marcos Baghdatis did not finish until 4:34 am, prompting complaints from the men that they were being unfairly treated. Organisers had traditionally scheduled two singles matches for the night-session at the Rod Laver Arena with the women playing first followed by the men. To appease the men, tournament organisers agreed to alternate the schedule this year, giving them the chance to play the first night match and leaving the women to play last. Kuznetsova got her first taste of what it was like to play into the small hours when her third round match against German qualifier Angelique Kerber began just before midnight on Friday. The French Open champion eventually won 3-6, 7-5, 6-4 just before 2 am but said it was an experience she would not want to repeat. "I was running and going crazy in the locker room so I can stay awake," the world number three said. "I had to remind myself I'm playing the Australian Open, it's not just a regular tournament. "You kind of lose the importance of these big events. For Russia it's great, they can watch my match on television, but for me it's two o'clock in the morning." Kuznetsova's comments followed a similar complaint from Australian teenager Bernard Tomic earlier in the week. Tomic was hauled before the tournament organisers to explain his outburst but Kuznetsova said officials needed to understand the players' view. "I grew up in a sports family and my parents always taught me to wake up at eight and to go to bed at 10," she said. "I don't understand why we have to play after the men anyway, I think it's never happened before. We need equality, the men have complained, it sounds weird. "But I don't even think men should play at two o' clock in the morning." Justine Henin, who beat Elena Dementieva in the first night match on Wednesday, said even her finish, which was much earlier than Kuznetsova's, had effected her for days. "I faced a few issues and my body suffered a lot," said the Belgian, who is in the early stages of a comeback. "I did not have enough sleep. I slept terribly. I was in bed at two when I beat Dementieva. I slept five hours." To help her stay awake before her match, Kuznetsova decided to join the spectators in the stands and watch the men's contest between Rafa Nadal and Philipp Kohlschreiber, a four-set match which went three and a half hours. "It was frustrating. They told us if it was going to a fifth set we were going to be moved to another court," she said. "I agreed to move court if it went to a fifth set but I was praying to Rafa to win in four sets because I wanted to play on Rod Laver (Arena). "It's better to play on Rod Laver than Margaret Court (Arena) where nobody is watching. At least people keep you up because you're falling asleep there." Image: Russia's Svetlana Kuznetsova celebrates after winning against Germany's Angelique Kerber. Novak Djokovic earned the Ironman title on the ATP Tour in 2009 by playing 97 matches, and the Serb world number three admits it annoyed him. "I've played almost hundred matches last year, and I got fed up, to be honest, with tournaments and matches," Djokovic said after he trounced Denis Istomin 6-1, 6-1, 6-2 in the third round of the Australian Open on Saturday. "I didn't have a lot of time really to recover and just to relax like most of the top players." The 2008 Australian Open champion still managed to win five titles and make five other finals last year, but his decision to retool his schedule for 2010 meant he decided not to play any ranking tournaments before the year's first grand slam. "Tennis-wise I wasn't ready for those tournaments (in the Middle East and Australia), so I didn't want to go there to play one or two matches (as) it didn't make any sense. "So I just decided to come here earlier, 10 days before the Australian Open starts, and put in some intensive work. Djokovic instead played the invitational Kooyong Classic, where he beat Germany's Tommy Haas but lost to Spain's Fernano Verdasco and Australian teenager Bernard Tomic. Image: Novak Djokovic of Serbia waves after defeating Uzbekistan's Denis Istomin. Danish teenager Caroline Wozniacki rubber-stamped her grand slam credentials on Saturday with a 6-4, 6-0 thrashing of Israel's Shahar Peer in the third round of the Australian Open. The 19-year-old stormed into the world's top five after a dream run last year, lifting three titles and making the US Open final, and is clearly enjoying the centre court attention. "Definitely I'm more experienced than I was just one year ago," fourth seed Wozniacki told reporters after wiping 29th seed Peer off the court in 77 minutes. "I've got a lot of matches under my belt so it's a great feeling. "I feel good out there and I feel like every time I step on the big courts I enjoy being there ... I know how it feels. I'm just going in there in my own bubble and I know what I have to do." Against Peer, who made the final of the Hobart International in the leadup to the Australian Open, Wozniacki's bubble appeared set to burst as the Israeli raced away to a 2-0 lead. But the Dane struck a vein of rich serving form to wrap up the first set, then raced to 5-0 in the second before Peer offered some belated resistance. The Israeli saved match points then prised two break points from Wozniacki but the Dane saved them both and sealed the match with a forehand volley. Wozniacki's next opponent Li Na, who defeated Slovakia's Daniela Hantuchova to advance, is likely to be a more testing opponent for the Dane who also made the fourth round at Melbourne Park in her debut appearance in 2008. The Chinese 16th seed came back from a set down to overhaul the Dane at the Sydney International in their last meeting. Image: Caroline Wozniacki shakes hands with Shahar Peer. Nikolay Davydenko avoided a potential nasty argument with his wife Irina after she snuck into his Australian Open post-match media conference on Saturday. The sixth-seed had earlier dispatched Juan Monaco 6-0, 6-3, 6-4 on Margaret Court Arena to advance to the fourth round when he was asked by a journalist if he would (hypothetically) like to marry another tennis player. "If I married another tennis player?" a bemused Davydenko responded. "Man or woman?," he added to laughter. The 28-year-old then, with his eyes darting around the room and a broad grin spreading across his face, replied: "I have already wife. I have my beautiful wife. I don't want to have any...."
He was then cut off by Irina. "I hear you," she said, as her husband buried his head in his hands and the packed room burst into laughter. "She's here," he added before the journalist apologised for getting him into trouble. Davydenko, who has finished the year in the top-10 since 2005, has been often overlooked in men's tennis, but is now rapidly gaining more attention after becoming the form player of the last six months. He won the year-ending Tour Finals in London and received some recognition from his countrymen. Even from Russian Prime Minister Vladimir Putin, though Davydenko was yet to receive the congratulatory letter. "He didn't know my mobile number, (so) he just congratulate me winning in London (with a letter)," Davydenko said. "He wanted to send (it) to me in London, but he don't know which hotel I was staying (in). "That's why he send to Russian Federation. I hope I pick up now this letter if I go to Moscow." He continued his rich run of form when he beat world number one Roger Federer and number two Rafa Nadal to win the Qatar Open in Doha shortly before the Australian Open. The Russian has also not dropped a set at Melbourne Park this year, has now won 12 matches in a row and his considered one of the favourites for the Norman Brookes Challenge Cup, which would be his first grand slam victory. Not that he expects his compatriots to celebrate, if he does manage to win the title. "I don't think so. It's not like football. "In soccer, yes, everybody go in the street drinking. But I don't think so if I win grand slam everybody start to drink, all Russia. "It (will) be Monday next day and everybody need work." 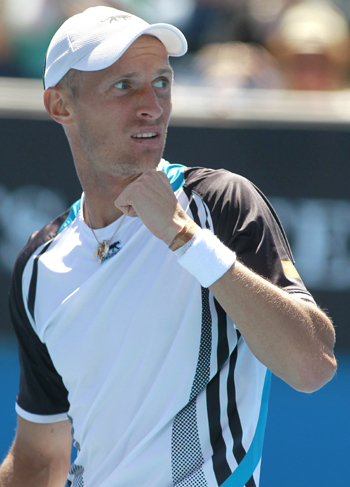 Image: Nikolay Davydenko reacts after winning against Juan Monaco. Serena Williams continued on her path through the Australian Open on Saturday with a comfortable 6-0, 6-3 third round victory over Spain's Carla Suarez Navarro. The top seed, who has been playing well within herself in the first two rounds, upped her intensity against Suarez Navarro to advance to the fourth round in 81 minutes. The diminutive Spaniard, who had knocked Serena's older sister Venus out in the second round last year at Melbourne Park, was unable to match the defending champion's power game. 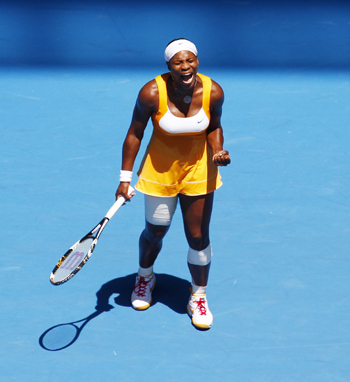 Serena will now meet 13th seed Samantha Stosur after the Australian beat Italy's Alberta Brianti 6-4, 6-1. Image: Serena Williams reacts during her match against Carla Suarez Navarro.